After a 19 hour training week, including a hot, windy and hilly 4 hour ride on Friday, I was up early Saturday (6-22-2013) to make the drive to Sierra Vista, Arizona under the light of the supermoon. 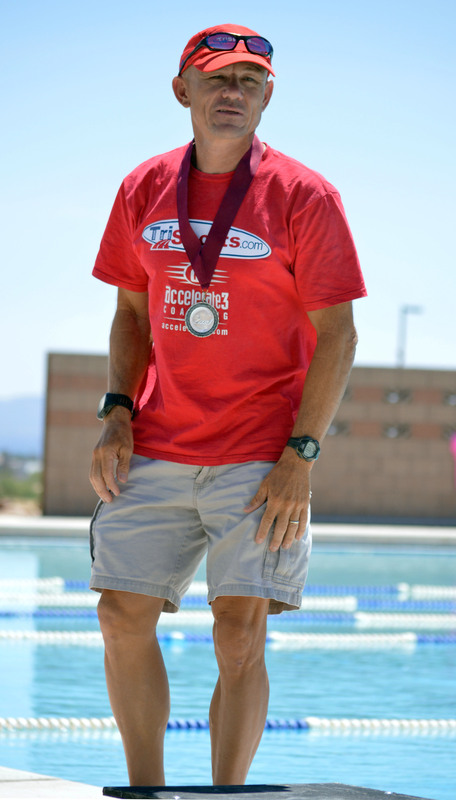 It was time for the 19th edition of the Ft. Huachuca Steelhead triathlon, consisting of an 800 yard swim, 12 mile bike and 5k run. I was greeted by a glorious sunrise as I rolled up to the bases front gate. A quick check in with the gate guard and then I was off to Irwin pool. I arrived with just enough time to pick up my packet, get body marked, set up my gear and get in a short run and swim warmup. Sporting #17 I was in the first wave. During my warmup I discovered one small annoyance. In my assigned swim lane, at the far end, was a climbing wall. The wall protruded into the water and extended about 2/3 of the way across my lane. When doing my flip turns, one foot would land on the climbing wall the other would barely hit the pool wall. Just something I will have to deal with! After the national anthem, we were back in the pool and ready for our 0630 start time. At the sound of the horn we were off. By the 4th lap of the swim my lane mate started to drop back a bit allowing me to move over at the climbing wall end of the pool just enough to get both feet on the wall during my turns. I was swimming strong and felt good. I watched as the girl in the next lane swam effortlessly while lapping me twice. I hate fast swimmers! I exited the pool in 10th place and hit the lap button on my Garmin…unfortunately, later I found that I had actually hit the stop button so no splits for the day. The run to T1 was about 200 meters. T1 went smooth…goggles off, helmet on, unrack bike, run to mount line. I got up to speed and then put my bike shoes on. The course starts off with a half mile slightly downhill to a sharp turn, then rolling hills for about 3 miles followed by a gradual 2.5 mile climb to the turn around. For the first 4 miles my legs felt like they were going to explode. The headwind out didn’t help. I was hurting but powered on passing 6 people by the time I hit the turn around. I held my position, gaining slightly on the top 3 guys, back to T2. As I approached T2 I saw the top 2 guys running down the road followed shortly after by the 3rd place guy. They had about 2 minutes on me. As I approached the dismount line I slipped out of my shoes and hit the ground running. Bike racked, helmet off, running shoes on and then hit the run. Hat, glasses and number belt on on the go. The run is an out and back that starts with a slight downhill for half a mile and then flattens out to the turn around. By this time the sun had started heating things up. My leg turnover was good. I got into my stride quickly. A quarter mile into the run I was passed. I started to try to match his pace but realized quickly that that would not have been a good thing. I dropped back to my pace and watched him slowly pull ahead. At the turn around I saw the top 2 guys running strong together about 1:30 up on me. I saw 3rd and 4th had about 20 seconds on me. As I started the last half mile up the hill I could see the 4th place guy up ahead. I focused on my run form and turnover and closed the gap. By the top of the hill I had caught the 4th place guy, but as I looked at his calf, found he was part of a relay team. I then ran strong to the finish to make sure I didn’t get re-passed. I crossed the line in 1:04:58…a course PR, 2 minutes off the winning time. 1st place was Luis Morales (1:02:42), a member of the Mexican National team, 2nd was Brian Grasky (1:03:01) and 3rd was Brandon Nichols (1:03:52). I was extremely happy with my race. In the past I have won this race with a 1:07 time. I was well under that time on a course that is now longer…the run was always about 800 meters short in the past. This year the course was changed to make the run a true 5k.